When I was in school there was this girl, I don't know her name we weren't in the same grade. But I remember her even today. Every day she would find an empty spot on the playground, stretch out her arms, and spin. While she spun you could hear a quiet "Wonder Woman ba-da-bup-bup-ba-da-ba". As kids we didn't appreciate her. Didn't see the magic in what she did. In those moments she was a superhero and the rest of us didn't exist, we didn't matter. She was whole and embraced who she was and in those moments she was Wonder Woman. After years of wanting to feel that way, embrace myself and be enough. Be my own super hero. I have found it, that moment of inner peace and acceptance. I feel that when I run. I feel so good in my skin, good about who I am. I feel like Wonder Woman, on my cool down I strut like a runway model I swear. I am the sexiest woman in the world. I know it! 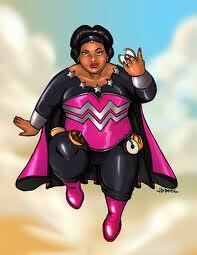 I realize the reality is I probably bare a closer resemblance to Fat Momma than Wonder Woman. But that is ok, Fat Momma is pretty awesome too. But it doesn't matter what everyone on the outside sees. I know who and what I am. So if you happen to see me running down the road no need to get your eyes checked. In that moment I really am a superhero with the stride of a gazelle.